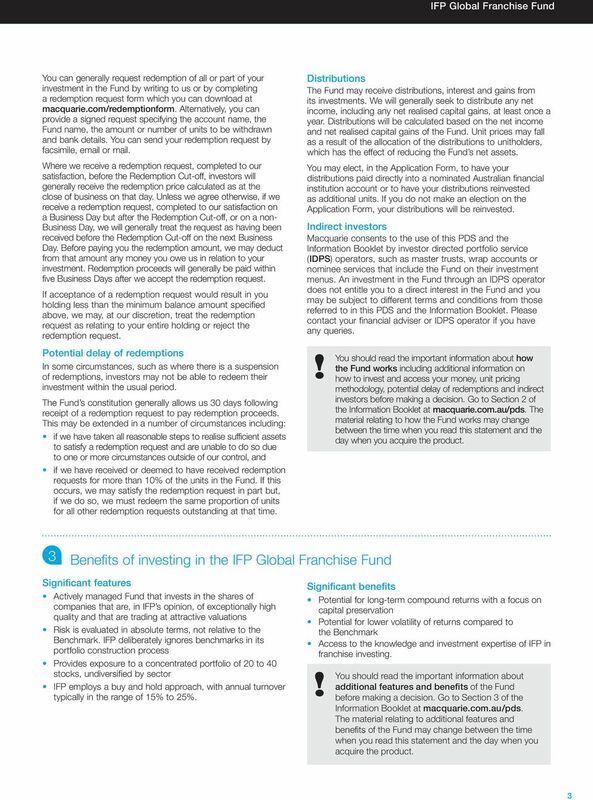 Download "IFP Global Franchise Fund"
8 7 How managed investment schemes are taxed Investing in a registered managed investment scheme is likely to have tax consequences. 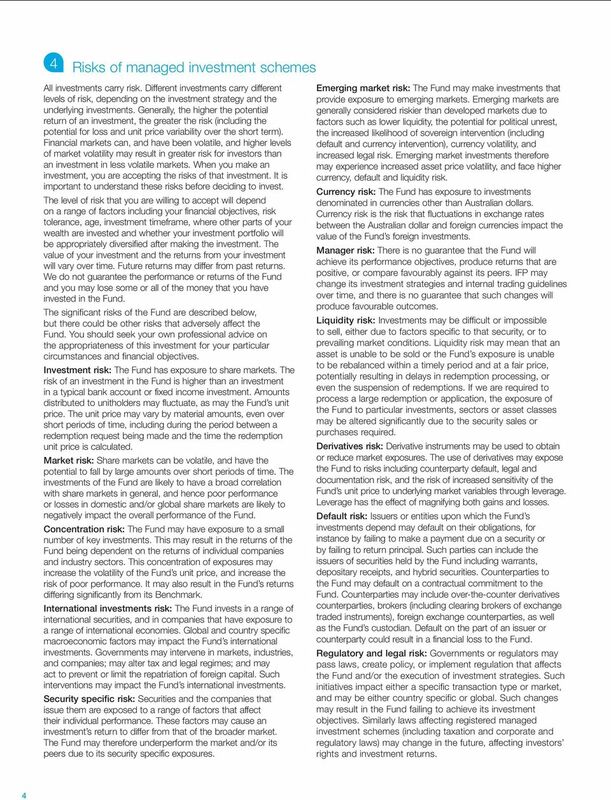 The information contained in the following summary is intended to be of a general nature only. It does not constitute tax advice and should not be relied on as such. You are strongly advised to seek independent professional advice on the tax consequences of an investment in the Fund, based on your particular circumstances, before making an investment decision. 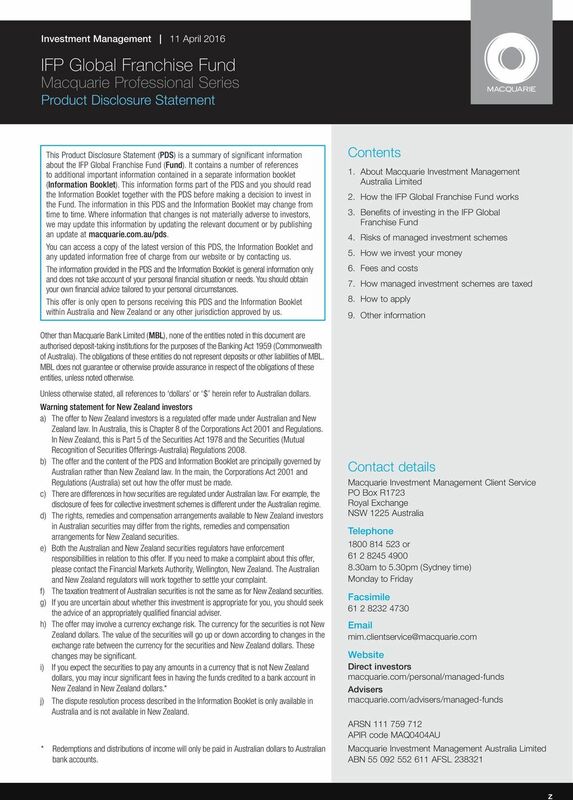 As investors in the Fund will be presently entitled to the entire amount of the income of the Fund (including any capital gains) for each relevant financial year, the Fund should not be liable to Australian income tax under present income tax legislation. 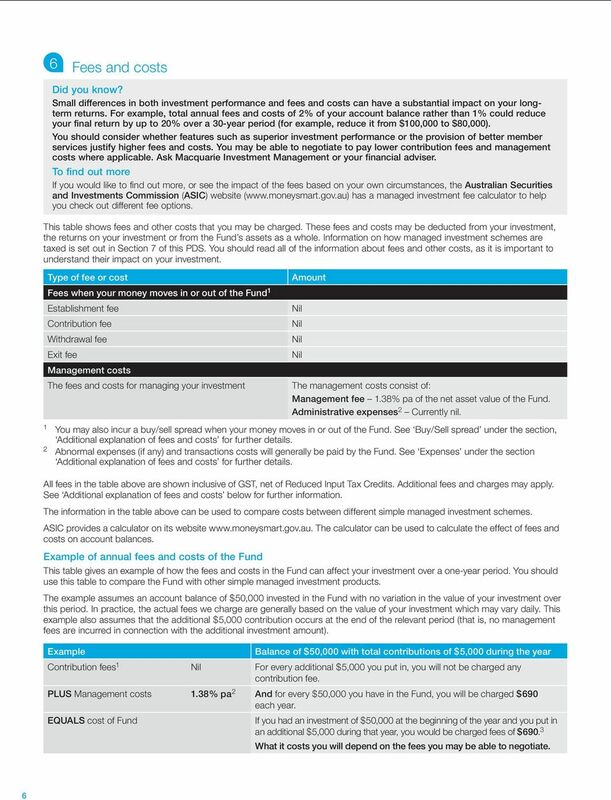 Investors in the Fund will be assessed for tax on their share of the net income of the Fund (including any capital gains) for a financial year. Capital gains or income arising from securities sold to meet a significant redemption can be distributed to the redeeming investor. A significant redemption is one where an investor s redemptions for the financial year are 5% or more of the Fund s net asset value. In these circumstances, the objective would be for remaining investors not to be affected by the capital gains resulting from a disposal of the assets where both the Fund and the redeeming investors make a capital gain in the relevant financial year. The 5% threshold may be varied by us with advance notice to investors. 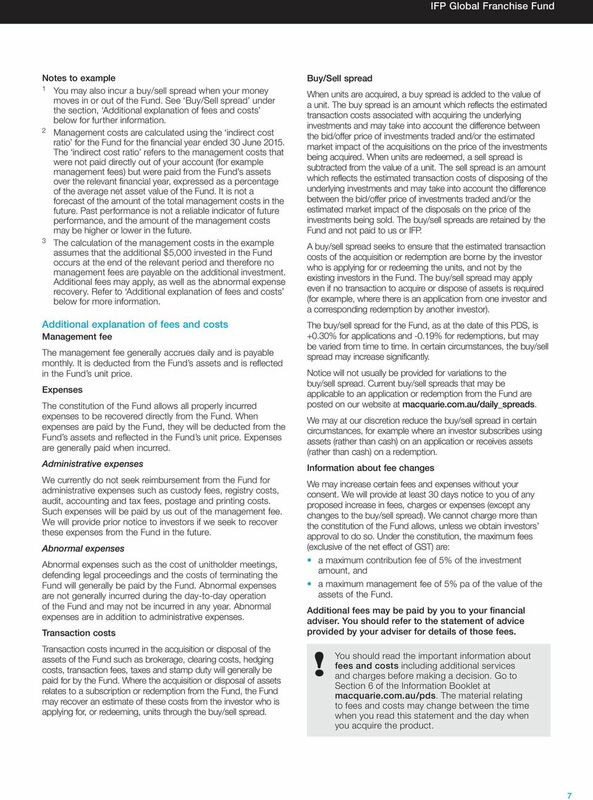 You should read the important information about the additional taxation matters relating to managed investment schemes before making a decision. Go to Section 7 of the Information Booklet at macquarie.com.au/pds. The material relating to the additional taxation matters relating to managed investment schemes may change between the time when you read this statement and the day when you acquire the product. 8 How to apply You should read this PDS, together with the information contained in the Information Booklet, available at macquarie.com.au/pds. Direct investors should complete the Application Form that accompanies this PDS. You can send the completed Application Form and required identification documentation to us by mail, facsimile or . If you fax or your identification documentation, the original should follow in the mail for our records. Your account may not be opened until your original identification documentation has been received. Cooling-off period If you are a retail client under the Corporations Act, you can terminate your investment in the Fund during the period of 4 days starting on the earlier of the time when you receive confirmation of issue of units in the Fund to you or the end of the fifth Business Day after the units are issued to you. 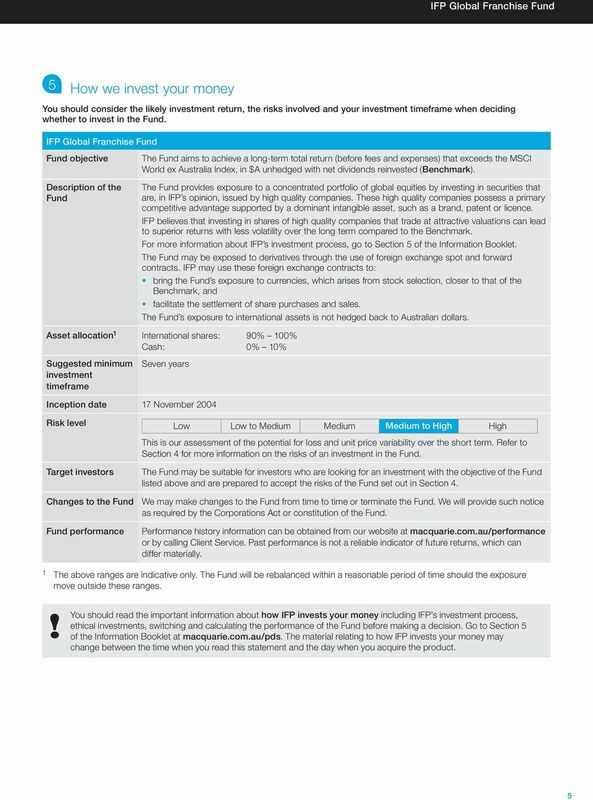 Your refund will be processed as a redemption and the redemption value will be reduced or increased for market movements since your investment. We will also deduct any tax or duty that is paid or payable by the Fund, any reasonable administration or transactions costs incurred as well as the sell spread. As a result, the amount returned to you may be less than your original investment. To exercise your cooling-off rights, please write to Client Service. Enquiries and complaints You may contact your financial adviser or Client Service if you have any enquiries or complaints. Written complaints can be sent to us at: The Complaints Officer Macquarie Investment Management Australia Limited PO Box R723 Royal Exchange NSW 225 Australia Our procedures ensure that we consider and provide a response to complaints within 45 days of receipt. You should read the important information about dispute resolution before making a decision. Go to Section 8 of the Information Booklet at macquarie.com.au/pds. The material relating to dispute resolution may change between the time when you read this statement and the day when you acquire the product. 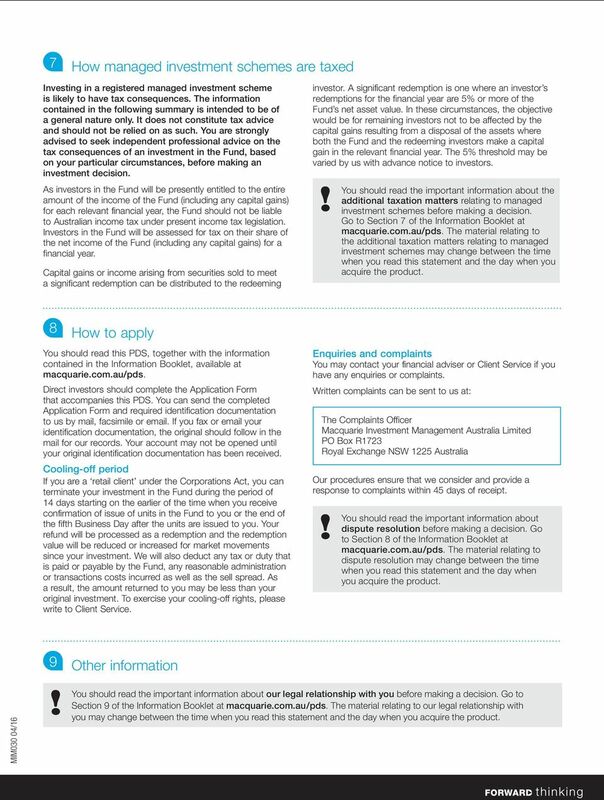 9 Other information MIM030 04/6 You should read the important information about our legal relationship with you before making a decision. Go to Section 9 of the Information Booklet at macquarie.com.au/pds. The material relating to our legal relationship with you may change between the time when you read this statement and the day when you acquire the product. 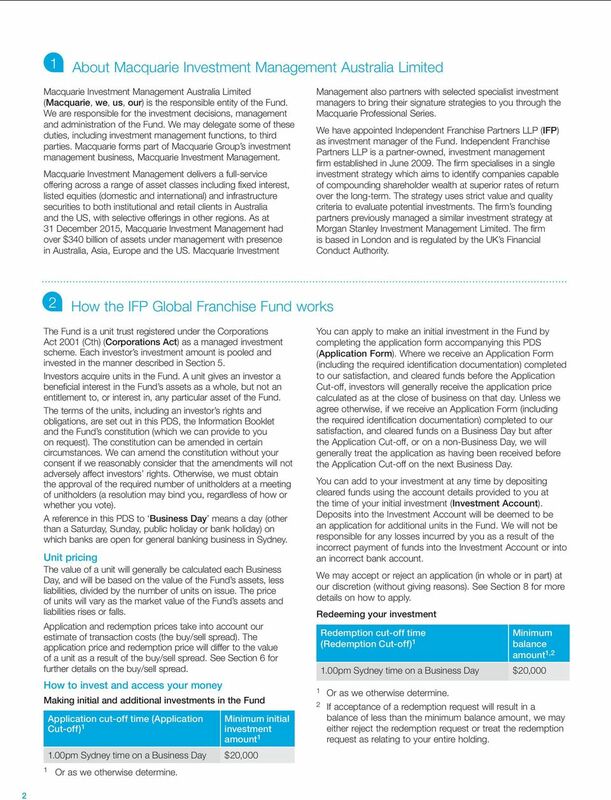 Magellan Global Equities Fund (Managed Fund) ARSN 603 395 302 ASX Code MGE Product Disclosure Statement 25 February 2015 Issued by Magellan Asset Management Limited ABN 31 120 593 946, AFS Licence No.